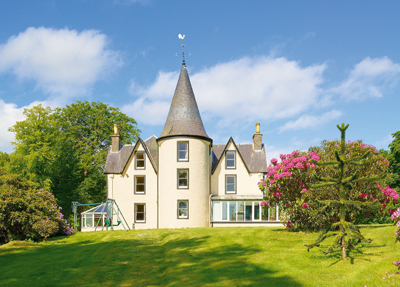 It is a truism that you get a lot more property for your money in Scotland, but how many people know that if you sold your one-bedroom flat in London’s South Kensington, you could buy a castle in Aberdeenshire? According to Ran Morgan of Knight Frank, if you double your journey time from London, you get 100% more property for your money. This makes Scotland especially good value, as the country isn’t as difficult to reach as some might think: Edinburgh is four hours by train, and an hour by air; Inverness is just half an hour further. Even better, some extremely beautiful parts of the country are surprisingly well served by public transport. Most houses in the Borders are just an hour from either Edinburgh or Carlisle, and Perthshire, Stirlingshire and Ayrshire all offer easy commutes to either Edinburgh or Glasgow. The same goes for properties close to Aberdeen, a city currently on a high from its thriving oil industry, and Inverness, capital of the Highlands. But whether you’re looking for an easily commutable family property, a far-flung romantic holiday cottage on a loch or a trophy estate with great sport, here is proof that a short flight north of the border will get you at least double the house for your money. This shooting and equestrian estate is set in more than 200 acres (133 acres of grass parks and 76 acres of amenity woodland planted with shooting in mind). The property includes an early-17th-century country house, three cottages, outbuildings and stables. The gardens and wooded grounds come to about 10 acres, and feature two ponds and a beautiful waterfall. The estate reportedly has more than 54 species of birds. Knight Frank estimate that if Cauldhame was situated in a prime position in Oxfordshire, it would have a guide price of £6 million to £7 million. This magnificent A-listed country house, which dates back to the 11th century, has a splendid Georgian façade and accommodation over three floors. The interiors boast four staircases and some very fine period features, including an Adam mantelpiece in the dining room and ornate cornice work on many other open fireplaces. The first floor has seven bedrooms, a dressing room and five bathrooms, and the second floor houses two attic bedrooms. The property also comes with a three-bedroom cottage, more than 17 acres of grounds and two paddocks with stables. Nick Rudge in Savills’ Banbury office says that in prime Oxfordshire, the property would be worth about £2.5 million. Milton Brodie is for sale through Savills (0131-247 3700; www.savills.co.uk) and CKD Galbraith (01343 546362; www.ckdgalbraith.co.uk). burial cairn near the shoreline. ‘This is arguably one of the best farms on Arran,’ say selling agents CKD Galbraith (01292 292319; www.ckdgalbraith.co.uk). Tim Fagan from Strutt & Parker in Ipswich believes that a comparable farmhouse with the same mixed land and cottage would fetch a whopping £4.5 million on the Heritage Coast in Suffolk. This is one of Skye’s loveliest cottages, set in mature gardens among unrivalled scenery, near Broadford. This simple property has two/three bedrooms, a sitting room, dining room, kitchen, bathroom and cloakroom. Included in the sale is an original croft, which is currently incorporated into the idyllic courtyard. But the real draw of Cala-na-Sithe is the spectacular rural backdrop and the views across to Eigg. For further information, contact Cameron Grant (07771 960326; jacgrant@3×1.com). In Rock or Salcombe, a similar cottage could be worth £600,000, says James Baker of Strutt & Parker in Exeter.